Recently, a friend of mine created a new Gmail account that included her full name instead of a generic screen name she had been using for the last several years. She called me up and asked me how she could move emails from one Gmail account to another. After fiddling around with it a bit, I figured it out and it’s not very hard. Of course, it would be cool if Gmail just had a button called Import that let you connect to your old Gmail account and import all the emails, but it’s not that simple. After you are done importing your old email, make sure to check out my post on what you should do after switching to the new email address. 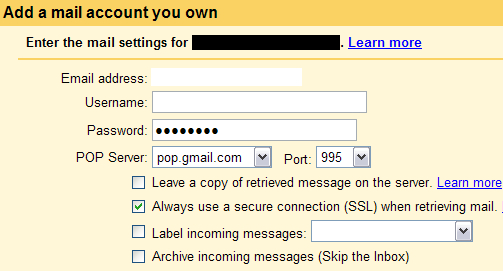 Step 4: Now type in the password for the old email account and choose pop.gmail.com from the POP Server drop down list if not already selected. The only option you might want to alter from the default is Label incoming messages if you want to be able to see where the new emails are coming from. Now just click Add Account. Step 5: Next you’ll be asked if you want to be able to send email as oldaddress@gmail.com. This is useful if you want the mail to come into the new account, but still have the ability to respond using the old email address.